In Matthew 25:40 Christ encourages us with the following words, “....‘Truly I tell you, whatever you did for one of the least of these brothers and sisters of mine, you did for me.’ The Community Service Club took the opportunity to put these words into action. In reality quite of few of the students at Lutheran East contributed to helping those in need. The Community Service Club used money from a school wide dress down day to take the opportunity to provide meals to more 100 people. 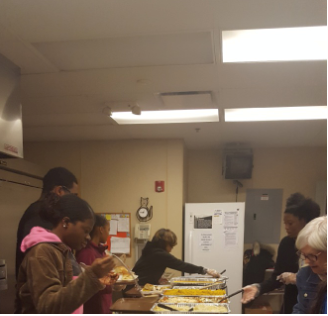 The club provided meals just before Thanksgiving on Tuesday, November 20th. We are proud to have students who regularly think of those who are less fortunate than they are. We all know the holidays can be a particularly difficult time for those who are in need or those who don’t have family to have a meal with. One thing is true: Lutheran East students made a difference that day! We must also take a moment to thank and to commend Mrs. Nagy for her efforts in being the leader of the club, and for being the one who does the shopping for the meals that are served. What a great community we have!